“The Wind is Not a River” is compelling reading. I read it at every opportunity during three days. Then, the ending just took the wind out of the sails. After reading the last chapter, I felt that author Brian Payton toyed with my emotions, which really lessened my enjoyment of the book. Attu is 1,100 miles from the Alaskan mainland and 750 from Russia. It is known as the site of the only World War II battle fought on United States territory. On June 7, 1942, the Japanese forces, facing no opposition, landed on Attu and sent the 42 survivors of the 45 Aleut inhabitants to a prison camp in Japan. John Easely, the novel’s protagonist, is a journalist who parachutes from a plane that the Japanese shot down over Attu in June 1943. “The Wind is Not a River” is the story of his struggle for survival in occupied Attu and the simultaneous search for Easely by his grief-stricken wife, Helen. Easely hid in a cave eating seaweed, mussels, and the occasional shorebird. A medium mussel has twelve calories, about one-half gram of fat, and about one gram of protein. Although he lost fifty pounds during his ordeal, it would have been hard to survive without eating an enormous number of mussels. Payton’s well-written story of Easely’s desperate plight was engaging. However, more detail about the island, the military occupation and the War would have improved the story for me. I found the love story of Helen in search of her husband to be much weaker and less absorbing. In theory, I should have loved the book, but this one was not for me. In all fairness I tried to enjoy it on three separate occasions. Brian Payton's novel, THE WIND IS NOT A RIVER, is set in Seattle and Alaska's Aleutian Islands during WWII. I've been fascinated by that remote island chain ever since my first hitch in the US Army back in the early sixties when I 'almost' was assigned to Shemya. (Instead I went to northern Turkey.) But that 'close call' was enough to arouse my curiosity about that remote and frigid island and its far flung neighbors of Adak, Attu, Kiska, and others that stretch hundreds of miles across the Bering Strait towards Japan and Russia. So the setting and era alone were enough to pique my curiosity. What I was not prepared for was the stunningly beautiful writing and the heartbreaking and riveting love story that forms the core of the novel. I finished reading Payton's novel last night and cannot stop thinking about John and Helen Easley and their incredible story, one of separation and survival, all in gorgeous writing that one rarely finds in today's fiction. The love story is blended seamlessly with the factual and historical, and that part of the novel will surprise many readers who knew little or nothing about the war with the Japanese that played out in the Aleutians. Because journalist John Easley's part of the story is one of freezing privation, starvation and survival on the barren shores of Attu, one of two islands (the other was Kiska) invaded and occupied by the Japanese in the spring of 1943. The other half of the story, Helen's, is equally mesmerizing, as she joins a USO troupe of entertainers to travel north in search of her missing husband. You could say this is one hell of a good yarn, and it is, but it is raised to a much higher level by the quality of Payton's writing. I can't begin to convey the intensity of the story or the beauty of the writing, so I'm gonna cop out and tell you to read the "Advance Praise" on the book's back cover - from authors Ron Rash, Julia Glass, David Vann and Wayne Grady. And, once you've read those words of praise, I will add, "Yeah, what they said - all of 'em." "Greathearted, beautiful, riveting, gripping, heart-rending, lyrical, elegiac, triumphant, heartbreaking, stirring, etc." All those words, yes! Like Prego sauce, "it's all in there." Read this book! It is just such a beautiful damn book. I give it my highest Booklover recommendation. 3.5. In 1942, the Japanese invaded and gained control of Attu ands Kiska, two of the American Aleutian Islands. Immediately American censors ordered a black-out, all journalists were made to leave and the native people on the other islands were evacuated, their homes burned by American forces. Another historical incident that is little known but brought to light as part of this story. This is a novel with a strong historical basis, but is also an adventure story, a survival story and a love story. In 1942, the Japanese military occupied two of the Aleutian Islands, Attu and Kiska, which were part of American territory. For more than a year, the American soldiers attempted to recapture the islands and defeat the enemy. An attempt to play down the crisis and large numbers of casualties, by forbidding journalists access to the battles zones, was instituted, in large part, successfully. The book was very poignant. It was a story of love and devotion above and beyond the call of duty. The reader will surely appreciate the book on the basis of its romance and suspense, of the analysis of the flexibility of the human mind and the resilience of the body under extreme stress, of the description of the characters and their monumental effort to survive. The ramifications of war and the devastation caused by the battles will strike its mark for the reader as the characters suffer, and muddle through, the effects of this war. The author wanted to illustrate the emotional and physical side of the war and he did accomplish that goal. The sacrifice, the loss and the degradation of those the war touched, came through loud and clear and illustrated another lesser known event of WWII. The author of this book wanted to create a narrative around the historic events that took place, in the only place where warfare occurred on American soil. As a novel, the book worked as a romantic thriller and mystery, as a story of survival, sacrifice and loyalty, but it fell short in the way of historic informer. The history seemed thin to me and may disappoint others. I, for one, did not know much about the Japanese invasion of American territory off the coast of Alaska, and I would have preferred to learn more about it. The attack on the Aleutian Islands was not covered by the schools I attended nor was it part of the curriculum when I was a teacher. As a result, I had the book would better inform me about the tragic elements of the war, other than that the soldiers were sent into battle without the proper equipment or supplies and that the battle was fierce with a massive amount of casualties and a huge death toll, because that is a fact common in most battles between enemies, and nothing new. For me, I would have liked to learn how the Japanese managed to take over the islands. Was America simply unprepared for an attack? Why was the government so afraid to inform the public about it, and how did they get away with not revealing the truth? Who was responsible for ordering the attack and how did the enemy slip through American defenses? Did many journalists defy the rules and sneak behind the lines, when they were forbidden access and the news was blacked out, or was this simply a fantasy dreamed up by the author? Were there any wives who tried to find their husband the way John Easley’s wife Helen did, even though it was, essentially, a futile attempt? Because the battle in the Aleutians was not widely covered, many in the US still remain ignorant about it. Were the Aleuts really evacuated by their own government and were their homes burned down? Were many slaughtered by the Japanese and others captured and shipped off to prison camps in Japan, without anyone ever finding out about it? I would have liked the book to include more of these facts and details that it lacked so that I would have fewer unanswered questions. A prologue with basic facts would have been a great addition to the book. The story, basically, is about a young man whose brother is lost in battle. When John Easley discovers his brother Warren is missing and presumed dead, he is determined to do his part to find out what happened to him. A Canadian journalist, he tries several times to sneak onto the battlefield, like a war correspondent, to observe what was happening, but he was turned back each time with a more and more severe warning. Finally, he tries again, dressing in his brother’s uniform; he takes on his identity and pretends to be a soldier. When the plane he is on goes down, he and another young man, Carl, a real soldier, parachute out of the dying plane and are the only survivors. Their survival will become the stuff of nightmares. Their story is gripping. The weather is merciless, the enemy is heartless, the danger is constant and any hope of a rescue is soon abandoned. At one point, John discovers a buried package containing a woman’s note to her lover. In the note, the woman named Tatiana tells her sweetheart, “wind is not a river”, which is where the title gets its name, however, I am really not sure what the title means, in terms of the book (perhaps that the wind cannot carry them home or offer an escape, but a river can), but the idea of this woman somehow sustains John and he hallucinates her presence and has conversations with her when his loneliness, hunger and despair cause him to lose touch with reality. He communicates with her and listens to her advice. She maintains a semblance of sanity for him although he is not quite sane and she is certainly not quite real. Meanwhile, John’s wife Helen, guilt ridden because of the ultimatum she gave him before he left, sets off to find him. Her plan seems ill conceived and truthfully, irrational. She abandons her father who recently suffered a stroke and becomes part of a USO entertainment group and requests to be sent to Alaska, where she believes John went missing. The author parallels Helen and John’s love story with the survival story of John and Carl and then John and Tatiana, John’s imaginary girlfriend and confidante. Both Helen and John experience loneliness, distress, hunger and cold, but for John, the suffering is far more extreme. A fascinating story, however I felt like the wife's storyline wasn't really plausible. A few characters also seemed to be just stuck in the story almost like placeholders or fillers, which was just kind of weird. The story of the war in Alaska was riveting, though. It's loosely the story of the Japanese invasion of the Aleutian Island chain (Alaska) during early WW II. Evidently the US Govt didn't want the general populace to know about this and kept it very hush hush. The story concerns a couple and their relationship, but it also is a survival story of how John Easley, a journalist who has entered the area without permission and, by virtue of his plane being shot down, is now stuck behind enemy lines without anybody knowing he's there. What a fascinating storyline!!! A gripping tale of survival against the elements, evading an invading army, and a woman’s determination to find her husband and bring him home are winners for this book. I was enthralled by every page. The author chose a fascinating area of WWII to explore; I don’t think I’ve seen another historical fiction detailing the Japanese invasion of American soil in Alaska and the media blackout the government put on it in the press. His research on the minutia of life on the Alaskan military front for the men who served and the women who entertained and the intense struggle for survival in the tundra kept me severely engaged. I also really enjoyed the writer’s use of imagery and symbolism, not something I usually notice. I don’t know if it was intended by the author or not, but his use of these symbols made me sit up and take notice. They added a depth to the harsh survival war story that wouldn’t be there otherwise. The whole dog thing… Wow… The way he uses that whole sequence to illustrate the dire straits that John’s humanity is in and what a human is willing to do/sacrifice to survive still makes my hair stand on end. Canadian journalist John Easley is despondent over the death of his younger brother in WWII. As a reporter, he thinks he can best pay tribute to the soldiers by covering the real news from the war front. He lives with his wife in Seattle and decides to report on the Japanese invasion of the Aleutian Islands in 1943. Due to censorship issues and fear that Americans will be jittery about knowing how close the enemy troops are, no journalists are permitted anywhere near the Alaskan conflict. John puts on his brother’s uniform and pretends to be a Canadian officer. While accompanying a plane load of soldiers near Attu Island, the plane is shot down and John observes the Japanese army from his hiding spot in a frigid cave. Meanwhile back in Seattle, Helen feels guilty about an argument she and John had before he left. She realizes she hasn't heard from him and begins to search for information on where he could be. She joins a USO troupe going to Alaska where she believes she will be able to track him down. John has the far more compelling story here. He must struggle to survive in the hostile environment and the things he does, as well as things that are done to him, are horrific in many cases. It was easy to visualize the bleak and bitter cold of the island. John and Helen may not physically be together but in flashback we get to see how dynamic their love story really is. I thought this was a fascinating and beautifully written story about a period of American World War II history that is largely unknown. I enjoy reading books that are set in World War II, and The Wind Is Not A River by Brian Payton had the added enticement of being about the battle for the Aleutian Islands that I knew nothing about previously. This was deliberately kept from the public at the time as the government did not want the people of the Pacific Northwest to know that the Japanese were close to obtaining foothold that would allow them to sweep down upon continental North America from Japan. This is also a survival novel, as one of the main characters has his plane shot down on a Japanese controlled island and is trying to stay hidden and live off the land. The Wind Is Not a River is also a novel of love and commitment as one character struggles to survive and his wife struggles to find him. John Easley is a freelance journalist, he has come to Alaska both to find meaning in the death of his brother and to report on what is happening even though he had previously be ordered to leave. He and his wife argued before he left for Alaska and this haunts both of them. Helen, the wife, decides that she must find her husband and bring him home. And unfortunately I found this part of the story quite improbable and it raised so many questions that I found the momentum of the story suffered. bright summer suns, plates of winter ice-morning, noon and night. Wind rises up and fades away, but a river flows endlessly. World War II is the backdrop of this novel. John Easley, a journalist, addresses the death of his younger brother Warren (in Europe) by traveling to Alaska's Aleutian islands to investigate Japanese invasion. The area is censored by the US government. Unknown to others, he accompanies a bombing crew and is shot down over the island of Attu. This is his story of survival in "the Birthplace of Winds". With his disappearance, we also travel with his wife Helen. THE WIND IS NOT A RIVER is a perfect combination of fact and fiction. While presenting actual “events [that] are forgotten footnotes in the history of the Second World War,” Brian Payton tells a story of two people who might have been caught up in them. In this excellent, unputdownable novel, John Easley is a journalist who was in the Territory of Alaska when the Japanese bombed a naval base and an army base on islands there. Although the U.S. government orders all press corps out of Alaska, ensuring that civilians are mostly unaware that the war has come to the U.S., John feels they have a right to know and it is his duty to sneak his way back in. On his third try, he gets in and then accompanies an aircrew running sorties over the Japanese-occupied village of Attu. The plane crashes. What a mix of fact and fiction! 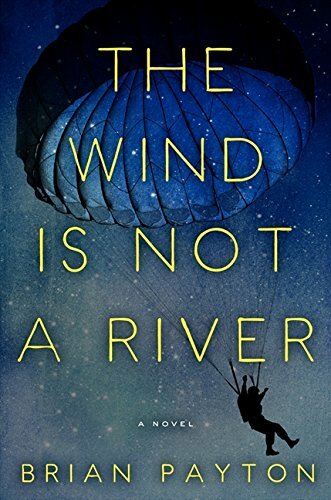 THE WIND IS NOT A RIVER continues to mix fact with fiction as it tells, in alternating chapters, the stories of John’s survival while he evades enemy detection and of his wife Helen’s determination to find him. This book truly grabbed me. Wherever I went, whatever I was doing, THE WIND IS NOT A RIVER was with me until I finished reading it. I not only enjoyed John’s and Helen’s stories; I also learned of this attack on the U.S. that the government mostly succeeded in keeping quiet.